When I was a little girl, like most kids, I had an imaginary friend. I named him Petey the Ghost. I was about four years old when I “met” Petey, and he soon started taking the blame for everything I did wrong. Who took all the clothes out of the drawer? Petey. Who made a mess at dinner? Petey. My imaginary friend was my scapegoat, and his existence was calming to me because he gave me an out. As a parent, I’m even more aware of the power of imaginative play now that my daughter Shiri has an imaginary friend. Actually, she has an imaginary community. She calls it her “ballet class.” Shiri has never had a ballet class in her life, but she has story after story about who is in her class, what music they listen to, and what happens each day. Needless to say, Shiri and I are not the first two people to make believe. Joseph, our predecessor in the Torah, also engages in some imaginative play. Unfortunately, his “play” leads to serious trouble. This week in Parshat Vayeshev, Joseph shares the dreams he has of his brothers bowing down to him, and they do not take kindly to this imagined scenario. They sell him, and then tell their father that they found him torn up by wild beasts. We then read about Joseph in Egypt and the way in which he ends up in jail. Only later in the narrative do we discover how Joseph’s imaginative play becomes a reality. Luckily for most of us, our imaginative play doesn’t take the dark turn Joseph’s did. For my daughter and me, the world of imagination is a place in which we can feel safe, where we can act out scenarios that might seem scary in real life. The benefit is that the lessons we learn and discover are part of our necessary growth and development as we figure out how to interact in the world. If you have some knowledge of the medical world, you may know that septic shock isn’t something you typically bounce back from. My mourning process for my father started when it became clear that he was not going to survive this attack to his vital systems. That’s when it hit me that I would be without my father’s physical presence for the rest of my life. It sounds strange to begin mourning before a death. After all, he was still breathing. But what triggered my early grief was knowing that each breath brought him closer to his last and that after he was extubated, any moment might be our last together. Everyone mourns in their own way. My mom, my sister, and I all expressed our feelings differently and on different timelines. I’m not embarrassed to say I was a wreck because I had already accepted the next phase and was plunged into the emotional depths of this loss, but my process was unique to me. We did our best to comfort each other, even as we were in three different phases and mindsets. Just as no two people are exactly alike, no two relationships between people are exactly alike. That’s the reason the mourning process works differently for every mourner. Individual circumstances shaped my relationship, so there was no “one grief fits all” solution for my pain. Parshat Vayeshev, which we read this week, shares this idea in its own way. The narrative begins with Joseph’s dreams and his brothers’ revenge on him for sharing his prophetic visions. Jacob is then told that Joseph is gone, and we read about Joseph’s experiences in Potiphar’s house, including his jailing and dream interpretation for fellow prisoners the butler and the baker. When Jacob is told of Joseph’s “demise,” he reacts as any parent would – he is inconsolable. The text literally reads that he “refused to be comforted.” The word for “comforting a mourner” in Hebrew is l’hitnachem, which is reflexive. Thus, Jacob refused to comfort himself. 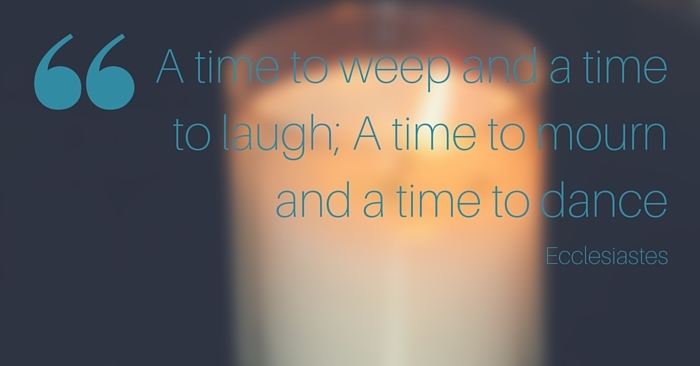 Samson Raphael Hirsch teaches that we can never truly comfort a mourner, even when we have known a similar loss. We can only surround the mourners with a sense of being cared about, in the hope that this will bring them to the point of comforting themselves. Parshat Vayeishev is a reminder that we all experience our relationships and the world in unique ways. For that reason, we’re not obligated to heal one another, we’re obligated to be there for one another so the healing can happen. It may not always be obvious, but our children are watching us and modeling their behavior on what they see. What do they see in you? This too is Torah. Growing up, I remember adults talking about how when they got married they “settled down.” I always envisioned settling down as a time when life was in order, you were financially secure, kids were settled, and life just seemed to have a consistency. Little did I know that my vision of “settling down” was far from the truth. As a grown-up, I may have figured out my career, and I’m certainly not a free-spirited teenager anymore, but my life feels anything but settled. We just moved across the country, and there are daily challenges, changes, and fun to be had with a toddler by my side. Our parshah this week, parshat Vayeshev, details Jacob finding his family and his way to a more settled lifestyle. Jacob’s sons are growing up, and the brothers begin their tormenting of one another. The text deals with the pain Jacob feels when he learns of the “death” of Joseph and continues with Joseph in Egypt while his brothers make a mess of their own lives. Jacob moves from feeling settled, having found a place to raise his large family, to feeling unease and unrest. The Torah, however, ignores the unrest of Jacob’s life by stating in chapter 37, verse 1 “Now Jacob was settled in the land where his father had sojourned, the land of Canaan.” According to Rashi, the great medieval commentator on our texts, the text is specific in using the word “settled” as if to say that Jacob thought he would finally settle down after all he’d been through, but events would not permit him to settle down. Jacob so very much wanted to be settled. We often set goals, like “I’ll settle down when I’m married…” only to realize that even when we reach these milestones, life is still full of challenges and uncertainties. It appears that Jacob wanted to yashev, to sit, and let the world continue around him while he settled in for the long haul. As we see by the storyline of his children, that was not the case. Our parshah teaches us that while we may want to sit and settle into one place, it turns into complacency when we let the world happen around us without actually participating. What we can do, however, is learn to be flexible and patient enough to always live our lives to the fullest, regardless of how settled we may feel at the time.